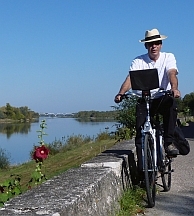 Get a real taste of France, exploring Alsace, the Dordogne, the Loire Valley or Provence and the Languedoc (Canal du Midi) by bike. Stop, sip back and relax. Drink in the views and flavours of famous vineyards from Vézère to Vouvray or Colmar’s ‘Grand Crus’ country to Châteauneuf-du-Pape. Opulent châteaux, clambering cliff-top castles; prehistoric caves and ancient aqueducts; lazy rivers, a monumental canal; sun-baked villages and Camargue white horses – there’s simply so much on the menu! 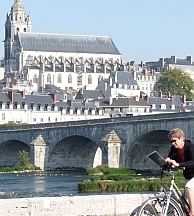 Our self-guided cycling holidays in France feature both linear and circular routes and include hotel to hotel cycling tours, plus single centre cycle breaks and bike and boat holidays in selected destinations. 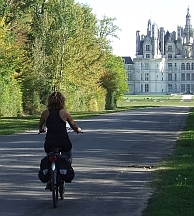 Just a little shorter than our FLC5 Loire Star tour, this single centre break lets you explore some of the most majestic and magical of the châteaux in the Loire at your own pace through a range of circular route options. With only 3 nights away, you might have harder choices when it comes to which of the châteaux-laden routes to select, but we'll still reward you with gastronomic delights on the last night! In a 3 star hotel in Chitenay. Fancy a truly French summer getaway? For sandy beaches, sea-air and a spot of really stylish island life, there’s nothing the French treasure more than their Atlantic Coast around La Rochelle’s beautiful Ile de Ré. But pop down first to Rochefort’s historic harbourlands and it’s only natural to pedal back via the coast’s wildlife-rich marshes around Yves – and the village of St Laurent (de Prée) of course! - plus chic Châtaillon-Plage with its casino, race-course and impressive waterpark. 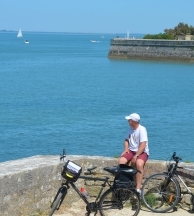 From the charming Vieux Port ramparts of cosmopolitan La Rochelle, the pale sands, white-washed cottages, abbey ruins and colourful marinas of Ile de Ré are all just a pedal push away. Cycling is certainly cool here, but then a glass of Charentais blanc in the company of fresh local seafood or oysters on some tempting bistro terrace is pretty refreshing too! In a 3 star hotel in La Rochelle. A single centre tour to let you explore some of the most majestic and magical of the châteaux in the Loire at your very own pace through a range of circular route options. As you'll be enjoying the variety of different châteaux each day, so we thought you’d appreciate tasting different local flavours every night! 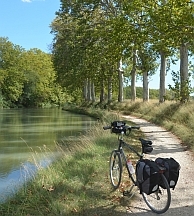 It’s amazing what great things you can experience on a ‘little’ cycle tour along the Canal du Midi! Take the über-impressive castle at Carcassonne or the nine lock staircase and mighty Malpas Tunnel just outside historic Béziers for example. Or the expansive stretches of Languedoc vineyards and awesome vistas from ancient Cathar villages. The heat is on to enjoy everything this sunshine area of France has to offer, but the cycling couldn’t be cooler – straightforward routes down shady, easy-going towpaths. What are you waiting for? In Carcassonne, Homps, Narbonne and Béziers. With over 1000 wine producers, breath-taking castle backdrops and countless fairytale villages, it’s no wonder Alsace boasts the best-loved ‘Route des Vins’ in the whole of France. Cycling here goes down a treat too, just like the local nectar. 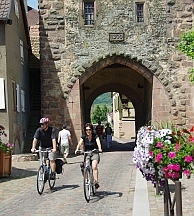 Follow easy canal paths and tiny lanes along gentle vineyard slopes to link Strasbourg with the Stork towers of Ribeauvillé and the timeless vineyard villages of the ‘Grand Crus’, then head back from colourful Colmar by train (ticket included in tour price), or cycle a final canal path back into the city if you prefer. A chance to savour the flavour of the place, drink in the stunning Vosges hills, views of woodlands and vineyards and even enjoy a refreshing trip around ‘Little Venice’ in the colourful town of Colmar. In Strasbourg, the Obernai area, the Riquewihr area and Colmar. A tale of five rivers along the Loire. Countless wonderful wines, 8 inspiring Châteaux, 5 winding rivers, 2 outstanding cities - one winning formula. 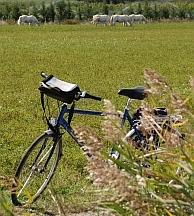 Cycle from Tours to cross the Cher and skirt the Indre’s watery meadows. Migrate from the castle-clad banks of the Vienne to the richest vineyards and love the Loire all the way to Angers. Flat riverside tracks and quiet lanes are combined with undulating countryside on this linear tour which reveals the Loire Valley’s sparkle through its waters and its wines. In Tours, Azay-le-Rideau, Chinon, Saumur and Angers. 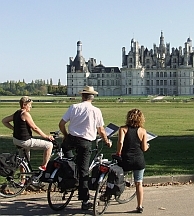 It’s the sheer magnificence of the Châteaux, not the pedalling which will take your breath away on this most enjoyable circular tour of the Loire Valley. There’s time to get acquainted with the Loire’s firm favourites like Amboise, Blois, Chenonceau and the mighty Chambord and to discover a whole valley full of lesser known castle gems. Our route gives both direction and detours, so you can pick and choose how many out of the 11 possible Châteaux you clock up over your five day tour. In Blois (2 nights), Amboise, Chenonceaux and Chitenay. Saints, bishops, kings, dukes and duchesses, even a mighty musketeer or three – you’d be hard pushed to be in greater company on this château-rich, river-hugging tour of some of the Loire’s best bits. Pedal along riverside tracks and quiet lanes through the green fields of the Beauce area near Joan of Arc's Orléans to the pastures, ponds and rich forest of the Sologne. The great hunting lodge at Chambord, Amboise and Blois are just some of the château turrets and towers which grace this rather majestic linear tour. In Orléans, Beaugency, Blois, Amboise and Tours. 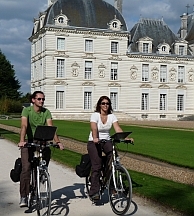 The gentle wine region around Saumur, Fontevraud L'Abbaye and Chinon is an intoxicating destination, just ripe for a short circular cycling break to enjoy with family or friends. This tour along some of the Loire Valley's most picturesque quiet tracks and lanes blends vineyard slopes with feisty fortresses, châteaux treasures and the resting place of the Plantagenets. In Saumur (2 nights), Fontevraud L'Abbaye (2 nights) and Chinon. From the prehistoric caves at Vézère Valley and Lascaux to the turreted châteaux and fortified ‘Bastide’ towns, there is history around every corner. Dramatic crags and breath-taking panoramas, rolling hills and thick forests make for the widest scope of landscapes all within a short pedal of the famous river valley. Cycling gently along flat riverside lanes, or climbing higher to picnic above the rooftops, this is a circular tour where every effort is very richly rewarded. 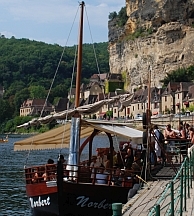 In Souillac (2 nights), Rocamadour, Gourdon, La Roque Gageac, Les Eyzies and Sarlat. Orange, Châteauneuf du Pape, Avignon and Carpentras - with Roman legacies and Italian influences, rich colours and Mediterranean sunshine, there is something miraculous and rather romantic about this part of Provence. We invite you to turn your attentions to water, then to wine in this great tour of rivers and fountains, famous vineyards and celebrated cellars. The quiet country lanes and river paths make for measured cycling, so you can really enjoy getting a taste for what Provence has to offer. 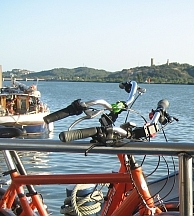 In Orange (2 nights), Vaison-la-Romaine, Carpentras, L'Isle sur la Sorgue, Avignon and Orange. Feel the thrill of seeing wild white horses and flocks of flamingos out on the brackish lagoons of the haunting Camargue. Drink in timeless views at Arles, Avignon and as you cross the River Gardon by the famous Pont du Gard aqueduct, and savour a glass or two of Châteauneuf-du-Pape in its home town. This part of Provence has a way of filling the soul. Its river paths and quiet roads past awesome Roman architecture and sun-baked farmsteads make for simply great cycling. In Orange (2 nights), Avignon, Arles (2 nights), Nîmes and Uzès. A circular tour to allowing time to view some of the most majestic and magical of the châteaux in the Loire. Spending two nights at Blois, Amboise and Chitenay plus one night at Chenonceaux, this tour gives you ample time to explore the magnificent Loire region. In Blois (2 nights), Amboise (2 nights) and Chitenay (2 nights). 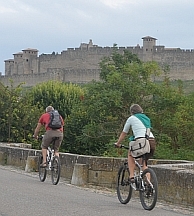 Few castle cities can be more impressive than Carcassonne - and there can’t be many cycle routes as straight forward as the Canal du Midi which carves its way through captivating Cathar country. Down in the Languedoc, the climate is close to sun-baked Provence, but canal-side, the cycling is refreshingly shady and wonderfully easy-going. Nothing beats a hearty helping of Cassoulet ‘at home’ in Castelnaudry, washed down with a glass of rich, red Languedoc-Roussillion, but this tour lets you put a toe in the Med too. A great linear tour, full of locks and lovely villages, vineyards and vistas, all across easy terrain with an optional climb, but just because the view is truly worth it! In Carcassonne (2 nights), Homps (2 nights), Narbonne and Béziers (2 nights). Alsace is brimful of delicious discoveries. From golden Gewurztraminers to sophisticated Sylvaners, Muscats, Rieslings and a whole colour palette of Pinots, its wines are the stuff of legend – and so too its fairytale villages, ruined castles and vineyard vistas. Sandwiched between the wooded hills of the Vosges and the Rhine plain, this is superb cycling country packed with must-see places such as Colmar - ‘Little Venice’; medieval Riquewihr; Haut Koenigsburg Castle; flower-filled Sélestat and the UNESCO World Heritage Site, Strasbourg. It also has more Michelin-starred restaurants than anywhere outside Paris – irresistible! In Strasbourg (2 nights), the Sélestat area, Colmar, Guebwiller, Riquewihr area and Obernai. If you love art and architecture, you’ll love Provence. 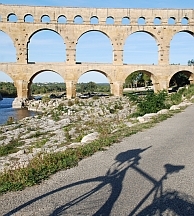 Pedal up to the vast Pont du Gard aqueduct. Take a break by the 13,000 seater arena at Nîmes. Wonder at the vividly lit landscapes which fired the imagination of Van Gogh and Gauguin or the natural, vibrant colours of the Camargue with its white horses, black bulls and pink flamingos. Provence is full of awesome surprises and the sheer scale of each one is even more impressive when you experience the region on two wheels. 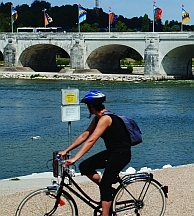 Let the sights not the cycling take your breath away on this gentle circular tour from Arles to the fortified ports of the Mediterranean and papal palace at Avignon, from delta plains to rich pine forests and rocky villages to the rolling vineyard slopes around Châteauneuf-du-Pape. In Arles (2 nights), Aigues-Mortes, Nîmes, Uzès and Avignon. Put the wonders of Provence into real perspective with a cruise along its sun-warmed waterways and spot of gentle pedal-pushing through Rhône Valley vistas, vineyards and the open countryside of the Camargue. The great River Rhône has made Provence what it is today – a world of deep cut gorges and wide delta plains, the centre of civilisations and reputed capital of Christendom. Join your floating accommodation by the famous Pont d’Avignon and pedal out for a taste of the place around Châteauneuf-du-Pape, before setting off on your voyage of discovery. As the crew sail the homely passenger boat along the ‘Grand’ and ‘Petit’ Rhône rivers via Arles to the canals around Aigues-Mortes, there’s both time to relax and enjoy the views on board and to follow optional circular day rides or linear cycling stretches where you’ll discover time-honoured aqueducts, abbeys and amphitheatres; rocky castles and quarry cathedrals; plus a world of wild, white horses and beautiful beaches down by the Mediterranean Sea. On board the boat, Caprice (up to 22 passengers) or L’Estello (up to 20 passengers), in an outside-facing 2 bed cabin with private facilities and air-conditioning . Here’s a refreshing way to experience all those must-see places in Provence. Start by the wild flatlands of the Camargue and dive down on your bike to the beaches of the Mediterranean coast. 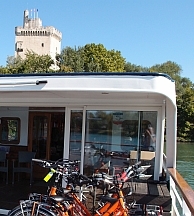 Then slowly enjoy the cruise as the crew sail the homely passenger boat northwards along the region’s warm waterways to Avignon, mooring up your floating accommodation for overnights and delightful day rides or linear cycling stretches. From Roman aqueducts and amphitheatres to iconic windmills and medieval cliff-top castles or the colourful landscapes around Arles where Van Gogh found his inspiration, there’s a feast of rich pickings to discover at your own pace, and what better way to wash them down than with a delicious glass of Côtes du Rhône on a visit to those classic vineyards around Châteauneuf-du-Pape. Get a real taste for ‘Nouvelle Aquitaine’ and the breath-taking Atlantic coast on a tour that’s the finest blend of ancient and modern. Enjoy the company of the Charente river as you get to know the warming flavours of Cognac country and pedal on through rolling vineyards towards the Roman amphitheatre at mighty Saintes. Historic Rochefort - built to a rigid plan to defend the French Royal Navy - may be a more sober affair, but its nearby oyster farms are an invitation to chew on things and chill out with a glass of Charentais Blanc, before coasting it up via stylish sandy beaches and more modern resorts to colourful La Rochelle and that French holiday island favourite, Ile de Ré. In Cognac (2 nights), Saintes, Rochefort and La Rochelle (2 nights). 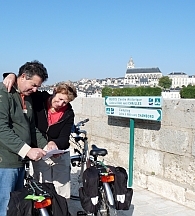 This Orléans to Angers tour joins our two linear Loire itineraries together to make one superb Loire Valley experience. Taking in three vibrant historic cities and countless châteaux both great and small, it's a great way to explore the very finest treasures of the Loire. 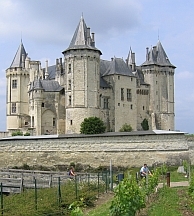 In Orléans, Beaugency, Blois, Amboise, Tours, Azay-le-Rideau, Chinon, Saumur and Angers.